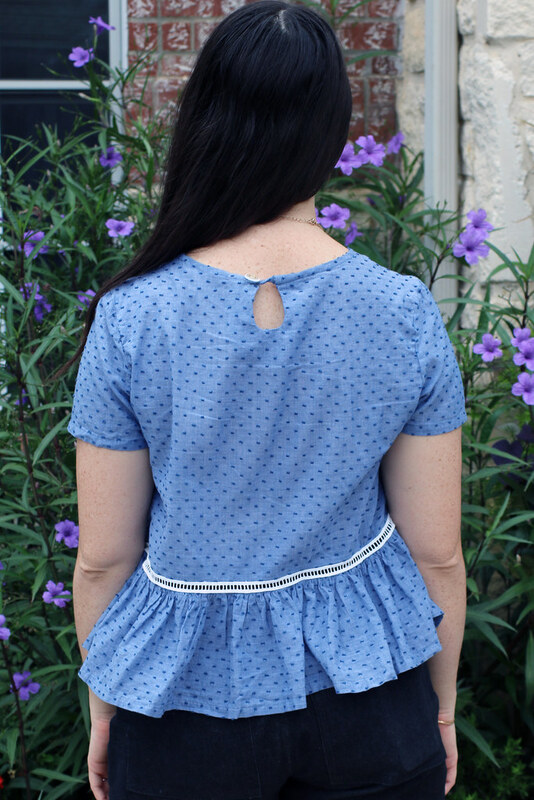 Continuing on with my #SummerSewing projects (1: Yes, I realize it is October, I’m just now getting around to blogging. 2: It is still 90+ degrees in Texas. Summer never ends…), this is my third and final shirt from my list. 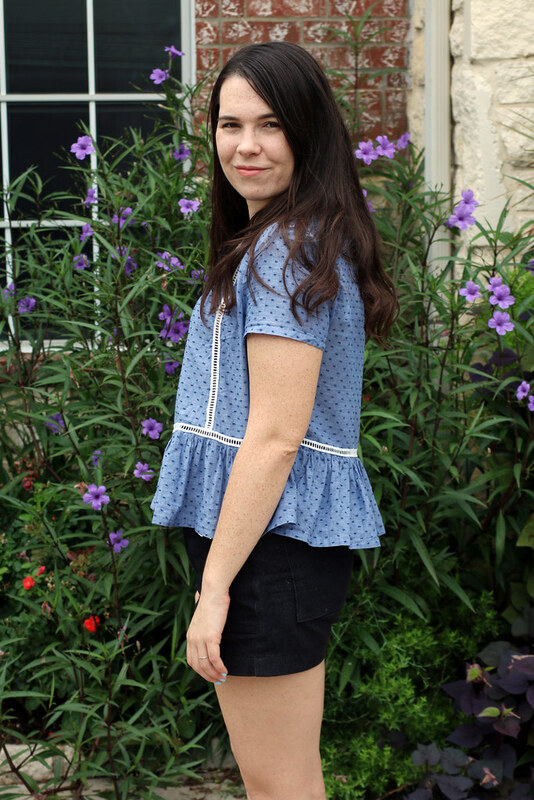 This is the Seamwork Hayden woven tee, altered to add a peplum skirt rather than a folded hemband. 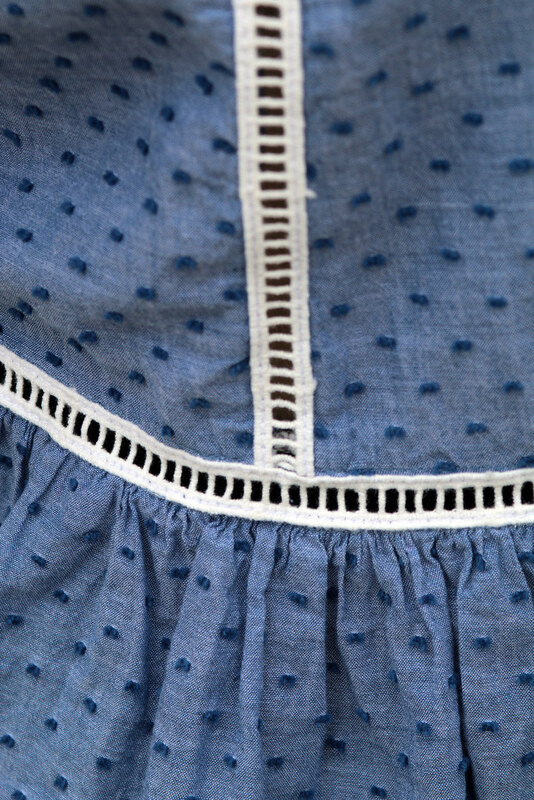 I also inserted ladder lace into the front and waist seamlines. 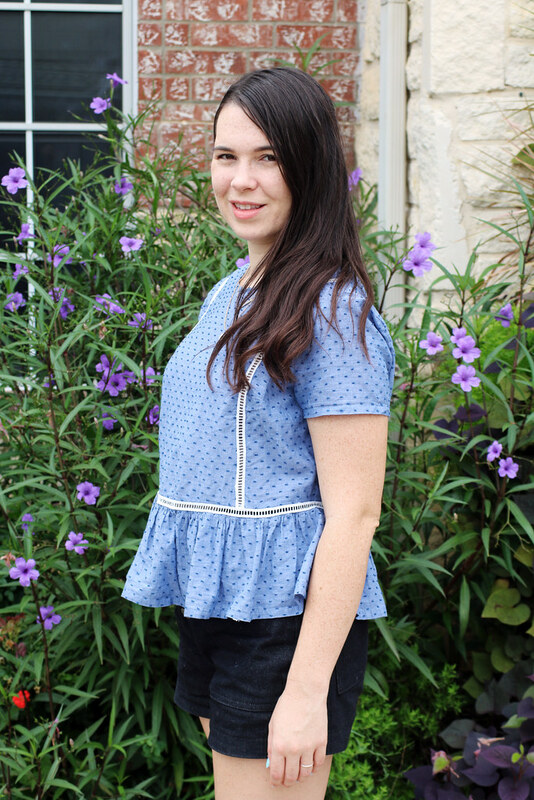 This super lightweight navy Swiss dot cotton came from Fabric.com and the lace from Etsy. The button in back is from my stash. 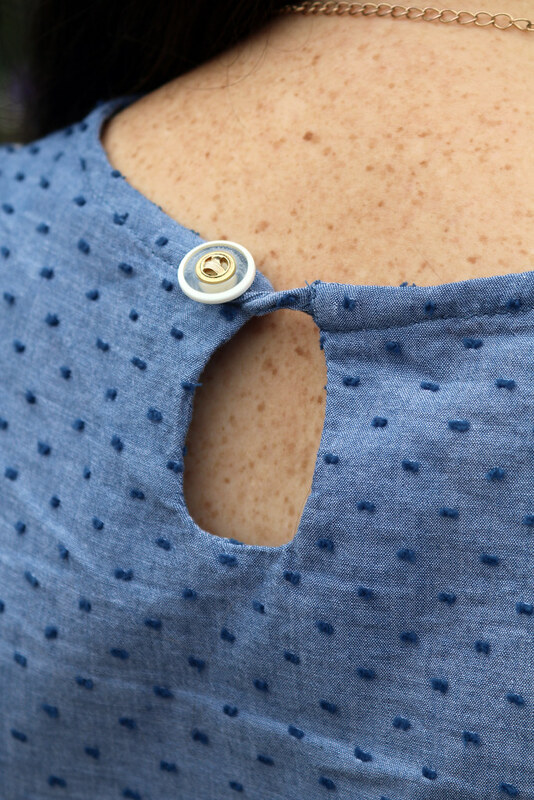 For my alterations, I began with the cropped version on this shirt. 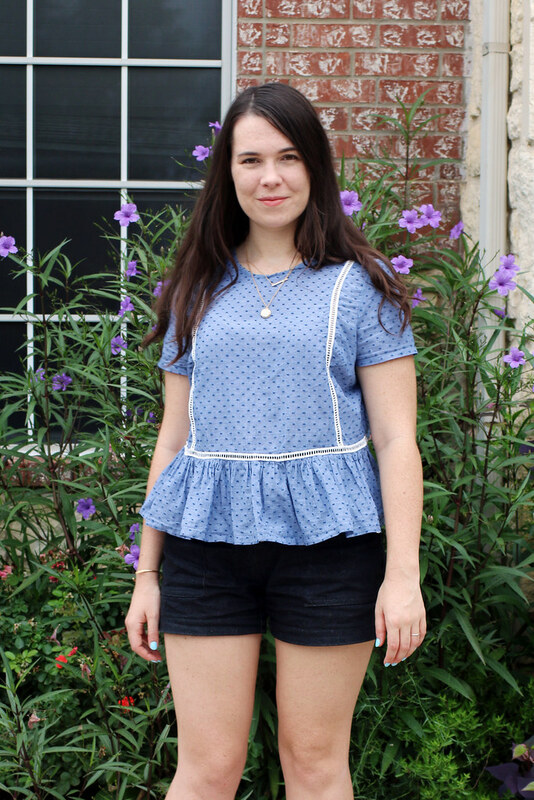 To convert the hemband to a peplum I simply doubled the length of the band pieces, stitched them together at the side seams, gathered the top edge and stitched to the lace. I did not fold the band up like in the original garment. 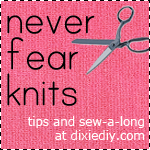 Rather, I simply hemmed the lower edge. This made the shirt about three inches longer than it would have been normally. I have to admit, of my #SummerSewing, this is the project I’m least excited about. I think I just wasn’t able to match my vision for this shirt with what the pattern could produce. My main gripe deals with the style lines. The princess seams aren’t proper “fit” seams. They don’t go over the fullest part of the bust. They sit closer to the side seams. This makes the front of the chest area seem wider than it is. Basically, I wanted a “loose,” “full” shape but the seam line placement creates an illusion that the shirt is too big. Even though the shirt fits in the shoulders and high bust, it looks like it doesn’t because that lace isn’t floating over the bust apex. Added to that issue are side-darts which are necessary because the seamlines don’t help the fit. The darts are hard to see but they create an awkward pointy mess where dart meets lace. Because the seamline is pushed toward the side seam, that means the dart point has to end further back from the bust apex than it normally would, only adding to the weird pointy effect. How can I describe it? It’s like the dart point doesn’t even touch my bust. It just floats off in space, away from my body. Like the point is repelled from the rest of me. I don’t want to say this is a bad design. My combo of light fabric and lace in the seams likely didn’t help things. This is a personal preference issue and while the design and instructions were fine, the end result is just not what I ultimately wanted. Next time I’ll choose a more traditional princess seam bodice (no darts) and use that as a basis for a shirt. I do think the peplum turned out well. It adds a fun touch to the shirt. Hey, they can’t all be winners!